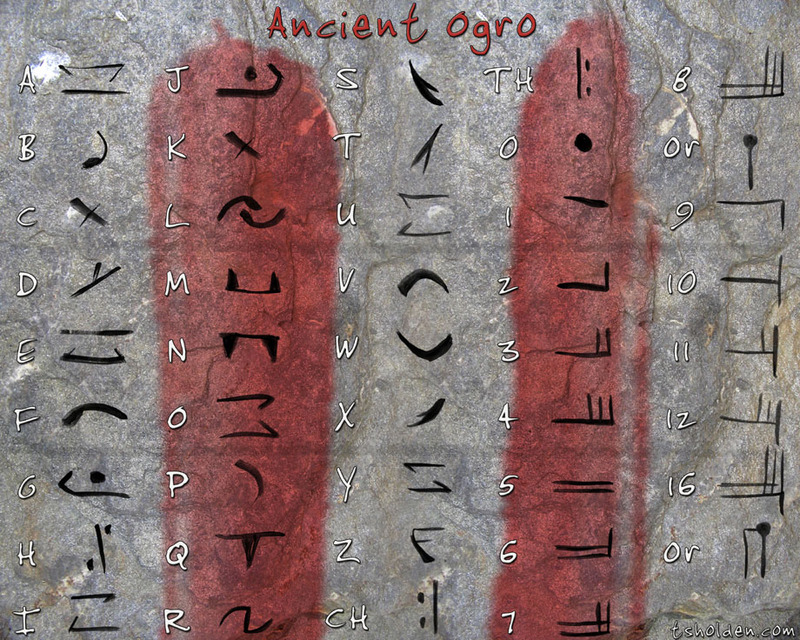 Because it has no connection to any human language, Ancient Ogro has a number of quirks we would find odd. Characters are written in vertical lines, read top-down, which is simple enough. However, consonants are written within the vowels they precede, in a horizontal line reading left to right. Consonants not followed by a vowel will be written vertically. Occasionally the letters M, N, and R are not enclosed in vowels; the Ogros consider them to be semi-vowels of a sort, or sounds that can be made without the assistance of a vowel. Perhaps an easier example would be the numbering system. Ogros have 8 fingers, as opposed to the human 10, so the Ogro numbering system is base 8. Notice that in the image above there is a symbol for 8 and then another symbol: either one is widely accepted. It is similar to how we can represent 10 as all fingers held aloft, or as one finger and a fist. Made with acrylic paint, paper, and photoshop.